Not too long ago, I received communion invitations for my daughter’s First Communion. First Communion is one of the three important events exercised by the Catholic next to Baptism and Confirmation. This is usually performed when the child turns seven years old. My daughter’s former school gave each student a program and prayer booklet before the actual occasion. The booklet contains Church hymns. The school also issued a certificate that signifies my daughter’s participation in the religious event… Time flies so fast indeed. The seven-year old girl in the picture is now a young lady. She is turning 14 next month. 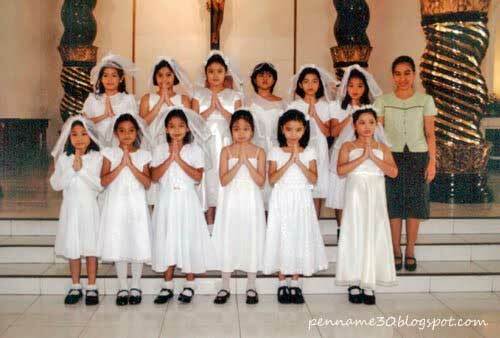 My daughter’s (third girl from right, front row) First Communion held at St. Peter Church Commonwealth. 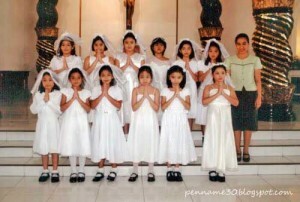 This entry was posted in Family and Kids and tagged communion invitations, First Communion on February 5, 2011 by Yami.